You've got the MacGuffin and the Big Bad knows it. So is he going to send his Mooks after you? Why not try to search your room first? This is always intended to be while the character is out—or, at least, asleep. Sometimes, it succeeds in that, and the search is carried out. There's two methods. Sneaky, and rushed. The sneaky way, the character only discovers the search when he returns and finds it subtly changed—maybe he was sneaky as well and planted threads or hairs on doors and such. The sneaky way often combines with planting bugs. The rushed way involves tipping over all furniture, cutting open mattresses, smashing windows, and dumping everything on the floor. Seriously, if the whatever is something small; the mess would be harder to find it in than anything else. Mooks that resort to the obviously ransacked technique may want him to know it's happened, may be Too Dumb to Live, or may resort to it because it's quicker. Sometimes the mess is intentionally created to stop investigators from finding out what's been taken. It is very, very, very rare indeed for them to find what they are looking for. On the other hand, the character can be in the room (by day) or wake up (by night) -- or return unexpectedly and surprise the searcher. Drama, and often violence, ensues. However, the searcher can, very likely, escape. Easily. On the other hand, Room Disservice sometimes comes into play, if the search is not obvious yet, and the searcher's position is not obviously comprising. By the way, the word "ransack" (rarely used in any other context) is from the Old Norse rann "house" and saka "search". Taken to extremes with Light in Death Note. He hides the titular Artifact of Death in a false bottom in his drawer rigged to incinerate the Death Note if it isn't opened properly. He also pulls the handle of his door upwards after leaving, along with putting a piece of tape on the door, because he knows that if his mother, father, or sister were to enter the room, they'd trip the tape-defence. When he finds the tape still on, but the handle moved, he knows that his room has been searched by pros. He's also got the pencil lead on the hinge that breaks when the door is opened (the pros didn't find that). Happens to Chiaki at the very beginning of Darker than Black. They weren't actually trying to find anything, though; it was just to send a message. Tintin's flat is ransacked in The Secret Of The Unicorn after his MacGuffin is stolen. He doesn't discover the Plot Coupon which was formerly hidden inside it until afterwards—it had rolled under a chest, where the vandals failed to find it. There was a Mad Magazine satire once, which showed a picture of a room before being searched by the Queensland police, and then again after. It was very neat before, totally trashed afterwards. It was a puzzle: 'How many differences can you spot between this pictures?'. The correct answer, of course, was 'none'. Happens twice in Indiana Jones and the Last Crusade. Before Indy leaves the United States, Henry's house was ransacked by Nazi agents. After Indy reaches Venice both his and Dr. Schneider's rooms are turned upside down. It turns out that Dr. Schneider's room being ransacked was Invoked, as she was a Nazi spy and the ransacking was staged. In Gotcha!, both the CIA and the KGB ransack Jonathan Moore's apartment. They don't find the film spool he smuggled out of East Berlin because he kept it in one of his pockets the entire time. James Bond in The Living Daylights walks in on Kara Milovy trying to tidy her room, which was thoroughly ransacked by the KGB. In The Last King of Scotland, Nicholas Garrigan comes home to find his entire house (provided to him personally by Idi Amin) ransacked and his UK passport replaced with a Ugandan one. Outrageous Fortune plays this straight, then spoofs it. First, the two women go to Shelley Long's apartment while it's being ransacked. After a daring escape, they head to Bette Midler's apartment to find it a complete mess as well. Long panics and tries to run, but Midler grabs her and says "No, this is normal." The Tall Blond Man With One Black Shoe: a team of government agents are following a man pegged as a super-agent whistleblower by an interdepartmental rival - they sneak through his apartment while he's out, photographing all his persomal effects and planting bugs. The man, however, is an innocent regular guy randomly picked as a decoy, and his day-to-day activities are feverishly scrutinized by the agents. In The Game, Nicholas returns to his house to find it's been ransacked. Luckily, the pistol he hid in a hollowed-out book is still there, but it was a trick set up to make him think they didn't find the gun. They did find the gun and replaced the bullets with blanks. In Dan Abnett's Warhammer 40,000 Gaunt's Ghosts novel First & Only, Zoran comes to Gaunt because he is aware something is happening: he surprised a man searching his room. In Ghostmaker, Gaunt is startled awake and catches Inquisitor Lilith in his room. She assures him that she would not have done it if she had known he was there. Emil Karpo (a Russian cop) in Stuart A. Kaminsky's Russian mysteries did that once—as well as the usual thread, he put a single hair of his across a doorway or something, which let him know the KGB had searched his room. A grim subversion in Nineteen Eighty-Four—Winston Smith puts a white grain of dust in his diary, as well as the more obvious thread. He thinks his diary's safe, but later the Thought Police inform him they replaced the dust too. They may have been lying. Maybe. Harry Potter's dorm room is ransacked by a Voldemort-possessed Ginny Weasley in Harry Potter and The Chamber of Secrets. Technically, she wasn't possessed by Voldemort at that time. She could only be possessed when she had the diary in her possession. She was, however, terrified that Harry would talk to Tom Riddle in the diary and find out all of her secrets. JRR Tolkien's Lord of the Rings has an inn room ransacked by the Nazgûl, and by ransacked, I mean beds that were stabbed multiple times with BFSes. The hobbits, expecting trouble, had slept elsewhere and left bolsters in their beds. Played with in Hard-boiled Wonderland. Two men deliberately break into the main character's apartment when he's there to both intimidate him and search/ransack the room. James Bond's hotel room in Casino Royale is ransacked by Mooks looking for a cheque. They don't find it because he's hidden it behind the room number - on the outside of the door. In one Nick Carter Killmaster novel, the title character actually breaks the fourth wall concerning a search, telling people how James Bond ruined the "hair on the doorjam" technique, that he now used a new one, and that we were crazy if we thought he was going to reveal it in a lousy 95 cent paperback. The rushed version shows up between scenes with Han's room in The Courtship of Princess Leia, although it hardly matters that it's obvious since he skipped town with Leia already. Subverted in Rob Grant's Incompetence. Harry intentionally keeps his apartment messy, but takes photographs before he leaves, reasoning that any fool can ransack a tidy room and replace it as it was, but it takes a professional to ransack a messy room without being noticed. 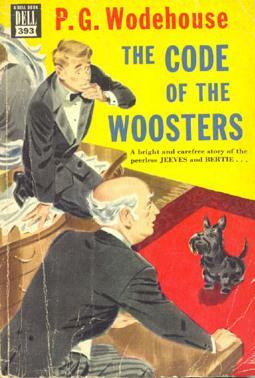 In The Code of the Woosters Jeeves and Bertie search Stiffy Byng's room because Bertie reads a detective novel containing the trope that the top of the cupboard is "every woman's favourite hiding-place." They find themselves treed by an Aberdeen Terrier. He corrected me respectfully, giving it as his opinion that the undersigned was not a tiny little dog, but well above the average in muscular development. In particular, he drew my attention to the animal's teeth. The X-Files ("One Breath"). Mulder is informed by his mysterious informer Mr X that the men responsible for Scully's kidnapping and subsequent coma will be coming to search his room tonight, giving Mulder an opportunity to kill them in 'self-defense'. Instead Scully's sister turns up and shames Mulder into going to the hospital instead. When he returns Mulder finds his apartment trashed and breaks down in tears, thinking he's missed his chance for revenge. But Scully wakes from her coma the next day, making the need for revenge moot. Outrageous Fortune. Happens several times through the series. Van & Munter stealing the "smoking gun" for Jethro. Rushed, made to look like a normal robbery so it doesn't get back to Jethro. Loretta stealing the money lenders cash from Draska. Rushed, had to steal the money before Draska sobered up. The Horsemen raiding the West house. They couldn't find the drug money so they stole every object in the house. On Heroes, Mohinder comes home and surprises a Company agent searching (and bugging) his apartment. The agent claims to be an exterminator, and protests "this man pulled a gun on me" to a neighbor witnessing the ensuing fight. Of course, the gun holster exposed under the agent's jacket makes this lie rather obvious. On Burn Notice, CSS agent Jason Bly has Michael's apartment searched. It's a subversion in that Michael is there at the time. Also, Bly doesn't expect to find anything; he's just doing it to mess with Michael. In Community episode "Cooperative Calligraphy", Jeff ends up doing this to the study room in search of Annie's pen. The Nickelodeon Game Show Finder's Keepers featured teams of children tearing through rooms of an on-stage house to find hidden objects for money and prizes. Estate of Panic, similar to the above, but with adult contestants ransacking a haunted mansion filled with booby traps and unpleasant animals to find cash. The 1993 Australian spy series Secrets showed how this is done in real life, with the fictional intelligence agency always taking polaroids of the room beforehand so everything could be replaced. The beginning of Indiana Jones and the Fate of Atlantis - Sophia's office has been searched, with items thrown everywhere. However, they missed her necklace, which was the only thing of value she kept in there, besides the Orichalcum bead. To be fair, they only look like small copper balls that glitter like fire, and contain enough energy to rearrange your DNA. The same thing happens in the prequel, Indiana Jones and the Last Crusade, where the villains ransack Jones' father's home in search for the Grail diary. Fortunately it was mailed to Indy beforehand. The rushed way is played out halfway through Snatcher, culminating in a very tense scene. This page was last edited on 25 September 2018, at 15:49.